Whether you use your laptop for work, play or to organise your life, you’re bound to need Microsoft Office 2016 at some point. 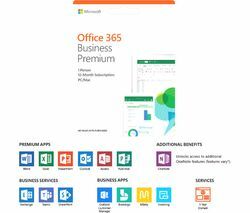 Microsoft Office software helps you meet all your word processing, database and emailing needs, thanks to its easy to use software and new, upgraded features. Currys’ great range of Microsoft Office programmes come with tons of tools to help you get jobs done, quickly and easily. Microsoft Word helps you type, edit and format documents. While Excel lets you manage your finances in a simple way. With Outlook you can keep on top of your business or personal emails, and keep in touch with the people that matter in your life. Choose Microsoft Office and you’ll also be able to store all your documents in the cloud. That way you can access your files wherever you are, whether it’s at home or on the go. The Office suite works across a huge number of devices, from PCs and Macs, to laptops and tablets. We also have a range of Office packages to suit different budgets. 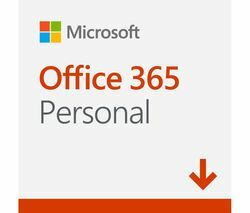 Microsoft Office 365 Personal gives you the whole Office 2016 suite, for one single cost-effective yearly price. While the Microsoft Office Home & Student, and Home & Business range, is ideal if you want to pay one up-front cost for a service you’ll use for years. If you’re looking for word processing software, Microsoft Office has everything you need. If you want to make sure your computer is fully equipped to meet all your personal and business needs, take a look at our range of PDF software available.